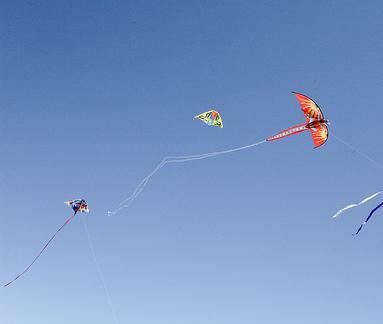 Kite flying is a fun activity which people of all ages can enjoy. All you have to do is go somewhere windy and you can literally go fly a kite. 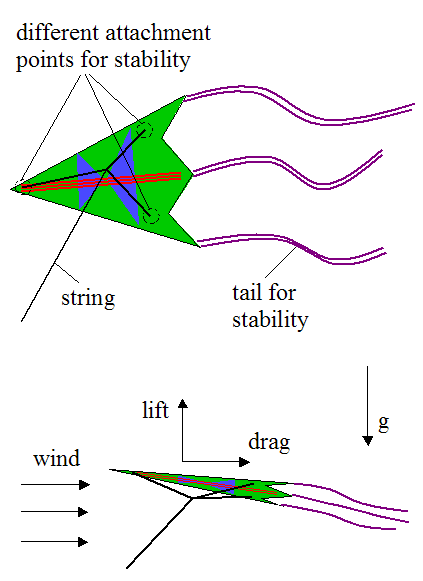 The physics of how a kite gains lift is very similar to how an airplane gains lift. The wings generate lift force by the action of the moving air over the wing surface. A kite works in the same way. The wind blows in the direction of the kite and somewhat underneath it. This creates lift. The figure below illustrates this. As shown, a string is attached to the kite in different locations so that the kite doesn't flop around in the wind. For further stability (as well as aesthetic value) a tail is often added to the back of the kite. If the wind were to blow the tail from the side, the kite would rotate until the tail (and kite) lined up with the wind. 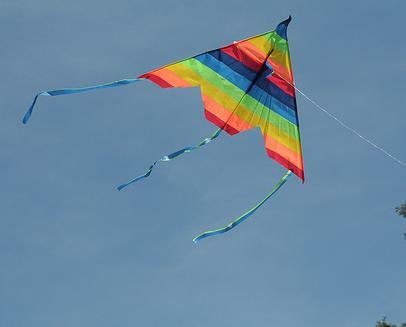 This allows the kite to remain straight and point in the direction of the wind. The photo below shows the tails of several kites. As shown in the second figure, a lift force is generated in the direction perpendicular to the wind, and a drag force is generated in the direction parallel to the wind. It's the same principal as if you were to stick your hand out the window of a moving vehicle. With your hand tilted clockwise the wind force would push your hand up (due to lift) and back (due to drag). Both lift and drag are unavoidable consequences of the aerodynamics involved. You cannot have one without the other. Since the lift force acting on a kite is usually quite small, they must be made of very light and rigid material to get airborne and stay in one piece. To get a kite airborne it is sometimes necessary to run while pulling the kite behind you. This creates "apparent wind" which creates lift and pushes the kite up. Once the kite reaches a high enough altitude where the wind becomes strong enough, you can stop running and the kite will remain aloft.